Prince Harry, 32, and his girlfriend Meghan Markle were spotted arriving southern Africa for a romantic holiday to celebrate her 36th birthday amid more speculation that he could propose to her. The royal and the Suits actress were photographed walking together from a plane, with Harry placing his arm around her. 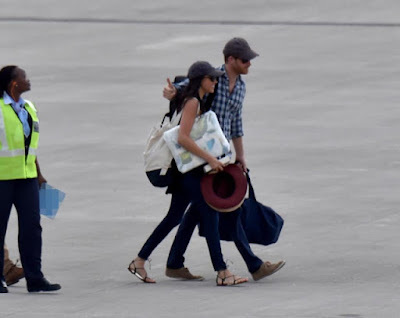 Harry looked cool in a checked shirt, while Meghan rocked a white vest top, skinny jeans and gladiator sandals. They complimented their outfits with matching grey baseball caps and black shades.